Once we finally and fully “hear” for the first time a new term or phrase, it seems to pop up everywhere! How about “clean eating.” Do you know what that means? Intuitively I knew what she meant, but the term did not fully register at first. Today on the Good Morning America news report I heard the term for the second time. I went online to learn more — so I admit here that I may be one of the last ones to “get with it” in terms of this apparently popular nutritional approach to health! According to Eating Clean For Dummies by Jonathan Wright, Linda Johnson Larson, “Eating clean is simply the practice of avoiding processed and refined foods and basing your diet on whole foods.” It means (1) eating whole foods, (2) avoiding refined sugar, (3) avoiding processed foods, (4) eating five or six small meals a day, (5) cooking your own meals, and (6) combining proteins plus carbs, or carbs plus fats. Simple enough. I don’t know about you, but “eating clean” also seems a bit intimidating to me. All six of the above steps might be too much to try to accomplish all at once. I’m one who has learned personal lessons about not making huge dietary or exercise changes at the same time. That approach is almost lethal for me and I suspect may be for many folks. Through some miserable experiences with “all at once”, I now know to make one modest change at a time, let it sink in and become more or less of a new habit, then move on to some other area of my life or figure or daily practices that I want to change. I’m pleased to think that I have already recently adopted one major “eating clean” change: giving up refined sugar! I’ve blogged about my progress since doing just that on June 15 upon returning from a lovely, but food-indulgent, camping trip to Yellowstone and the Tetons parks. From 120.6 lbs on June 15 I’ve dropped down to today’s weight: 112.6, a full eight pounds. I can’t say it was “without suffering” because it wasn’t. The first three weeks for me were hellish,with constant low-level headaches wrapping around the back of my head, and constant mild nausea sunup to sundown. It wasn’t pretty and I wasn’t nice to live with during those weeks. But Lee found it easy to do! She told me she had heard that their might be a gene related to those who loved sugar, but she felt she didn’t have it due to the ease of her decision when she implemented it. The only sugar she now eats is an occasional one square of dark chocolate a time or two each week. Mysteriously to me on the Monday of the fourth week, the suffering lifted. It dissipated a few days before that, came back a day, then totally disappeared. Slowly I’ve found that my overall energy level has increased and I’ve become so much more pleased with my weight, the look of my body as belly and thigh fat has been reducing, and most of all with the development of muscles in my legs and arms that I had lost over the past years of mainly computer-based business with no formal exercise program in place. Dropping refined sugar plus at the same time having a three-day per week exercise program in place, has led to my improved figure, weight, and overall health and energy level I’m sure. But now I think I need to do even better and use Lee’s example as inspiration to move forward. Once I started learning more about clean eating from Lee, I found that her pictoral food record was fascinating. 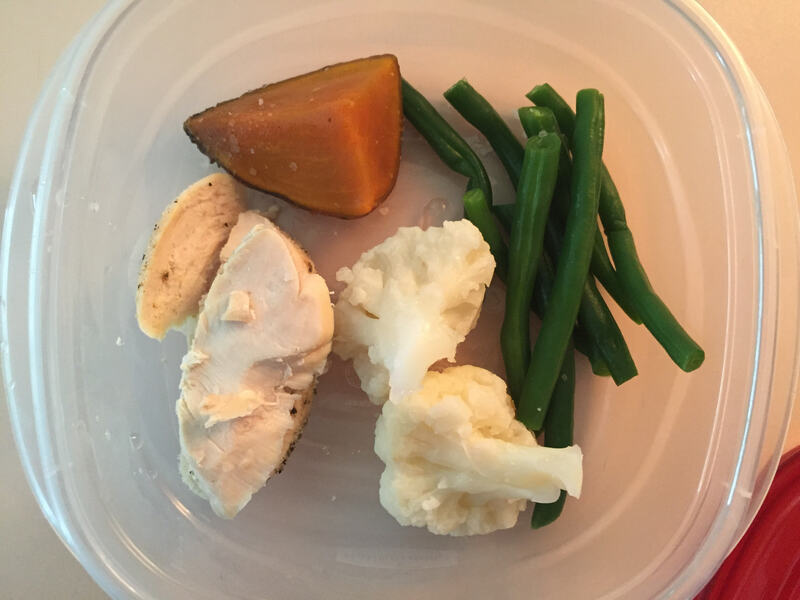 This blog includes images she has sent me of some of her meals during her first week of training, meals which tend to be quite similar day-to-day and meal-to- meal. She says she never gets bored. Boredom can be addressed by adding herbs and spices, with some suggestions included in the Clean Foods for Dummies page referenced above. I’ve always loved Mrs. Dash herbs which contain no msg, salt, or sugar. And nothing tastes as good as fresh minced herbs such as thyme, rosemary, and basil. Lee had initially suggested that, rather than send a boring written record, as I normally require and expect of my students for the first two weeks of training. The first thing I noted was how colorful her plates looked, and I’ve always loved color at an emotional level. It makes me happy. Looking at those plates could certainly inspire me! While Lee’s good habits in nutrition were firmly established, she is facing some current challenges due to her planned trip to France to visit a cousin. We had prepared her best we could for the flight and vacation as well, but still the challenges are developing. 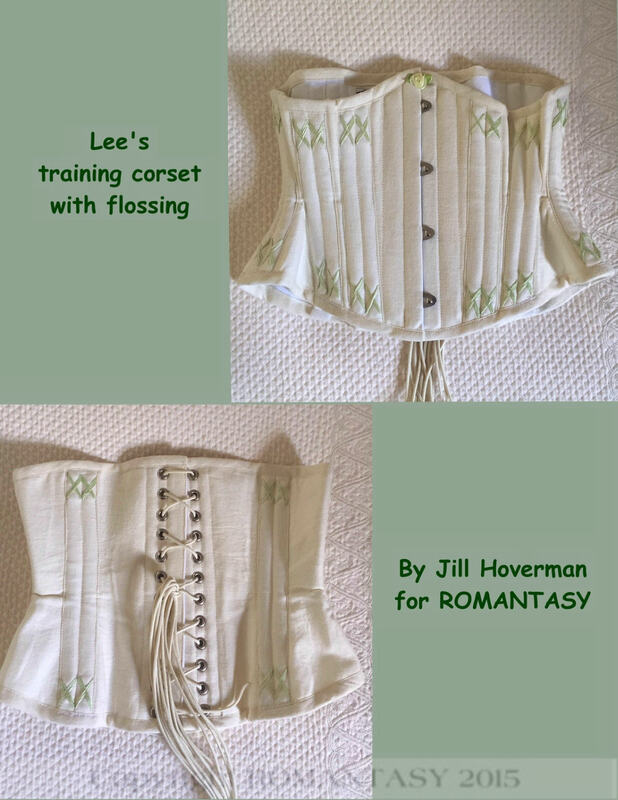 We won’t here discuss the corset-wearing challenges since our focus in on food, but needless to say the first “easy” week of seasoning her new training corset (pictured here ) became a lot more challenging on the flight and in France! We’ll cover those in another blog. Lee is doing well despite her apparent disappointment with herself, and the changes that were inevitably to be made during travel abroad. I surmise her disappointment in France is because of her personality and experience as a focused, disciplined professional in her demanding legal career. But perfection is not the goal here. I’ve emphasized to her that 95% is the goal during corset training — and that all the walking she is doing substitutes readily for a gym-based program that she is used to. If she has to loosen up the corset from time to time to accommodate a few rib sorenesses that are developing, or indulge in a few French treats or eat fewer meals than recommended for training, there is no shame in that. In a few days Lee will return to her home in Florida and pick up her normal program and eating habits once more. Good Taste – in the Mouth but Not on the Hips! I’ve noticed an interesting result of my recent waist-training efforts to drop an inch in my waistline and also off my hips. I’ve accomplished both things in eight weeks, chronicled earlier in this blog. However, along the way my taste has improved! I wonder how many times we dampen down taste by over-salting foods and eating too much sugar? Has anyone noticed that? We all know the general heath benefits from eating a low-fat, low-sugar, low-carb diet when we also eat lots of fatty fish like salmon, veggies and fruits. However, I did not anticipate that there is great pleasure also to be derived from a healthy diet like that! 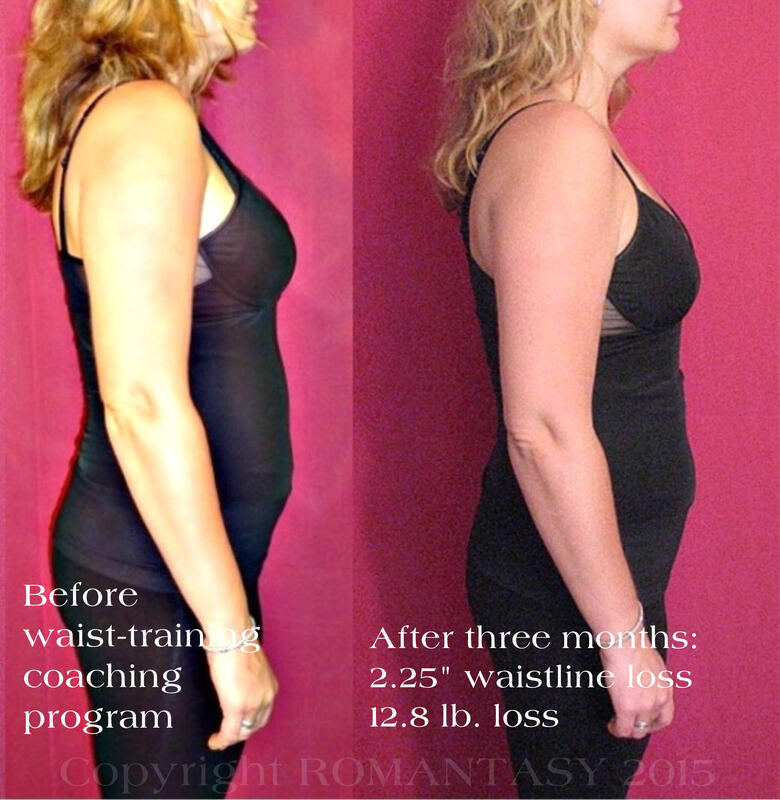 I remember Christine who was an early coaching student many years ago in my waist-training program. After a month of waist training and changing her food choices to focus more on veggies and less on fats and meats, she found for the first time in her life that she enjoyed the taste of celery! That comment in her final program evaluation struck me as a bit odd. It strikes me as a bit odd that a few weeks ago after being off refined sugar for about six weeks, I noticed that my snack portion of almonds tasted sweet. I had never noticed that before when eating almonds. I also adore dried sour cherries, which have taken on a kind of brillance of taste these days when I couple them with almonds (nuts reduce the speed with which the fruit sugar enters your bloodstream, all to the good). Last night in my attempt to find new non-sugar desserts, I tried a few wee slices of pineapple-encrusted svarin brillat cheese on a very slender half slice of sour dough, followed by a small slice of fresh nectarine. The cheese (and the nectarine also) was almost overwhemingly sweet (but deliciously so!). My partner said the combination held as much pleasure for him as does his favorite cheese cake! Amazing comment that certainly got my attention, as did my own taste response. My present waist-training student, Lee, agrees. When I discussed this development with her, Lee said that since she adopted a natural foods diet, her taste for fruits also improved and that grapes by now were “almost too sweet” to her. It’s an interesting adventure to experiment with one’s nutritional program, tweaking this or that and changing how we eat, then noting the results. Pay attention not only to results using the tape measure or scale as do most corset waist-trainees, but also note the more subtle pleasures that might just develop unexpectedly along the way, making the process of corset waist training both fascinating and rewarding as well! A study11 published in the New England Journal of Medicine in August 2013 demonstrates that even mild elevation of blood sugar — a level of around 105 or 110 — is associated with an elevated risk for dementia. I’ve become increasingly committed personally and professionally as a waist-training coach and adviser to my corset clients, to the matter of exercise and more recently, to reducing our intake of refined sugar. I knew about exercise and the brain, but now there is proof that not only does sugar relate to weight and shape, it also relates to our brain! If that isn’t sufficient proof that we must get hold of our addictions to sugar and pull out all the stops to reduce it in our diet, I don’t know what is. Often I am asked about age and corset waist training. I did not begin to corset until I was age 48 so I know it can be done later in life and most likely, becomes more, not less, important to pursue if one is interested in this strategy and technique for weight/figure control. Obesity is more of a problem for the aging person, especially as we tend to need fewer calories the older we are. We all know that as a matter of common knowledge. But we tend to forget it and as we age, go up not only in years but in weight. For women this trend likely contributes to a poor body image and discouraged feelings, whereas as we age and grow in wisdom, we also should be growing in contentment and pleasure in knowing more and taking better care of ourselves. I hope you read the full online report! I learned on today’s Good Morning America TV news show, that there is yet another research study out linking stress to obesity, as a fact not just a theory. The earliest report on that matter I found was on webmd’s website, mentioning a 2009 study. 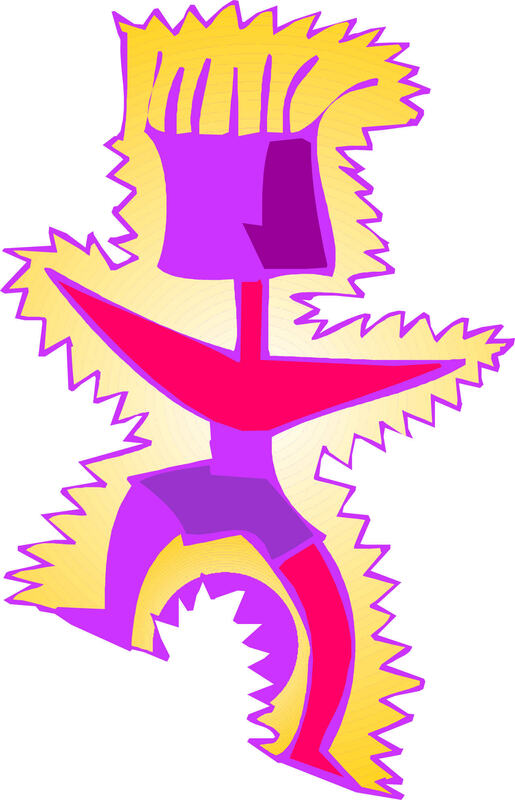 “Researchers found a molecule the body releases when stressed called NPY (neuropeptide Y). NPY appears to unlock certain receptors in fat cells, causing them to grow in both size and number.” The report seems to be linked only to chronic, ongoing stress, but I suspect that occasional acute stress can also wreak havoc. Their solution? Plan. Plan to shop. Plan to cook. Plan snacks. Basically think and don’t rush eating. I agree that this is one, if not “the”, key to dealing with stress. But another key is to stick to your own waist-training plan and be disciplined. I discovered and mentioned this in my book, with the section on Stress reiterated below. I hope it helps you follow your plan when you encounter unusual stress and are tempted to stray. Just let your nurturing parent step forward and impose some tough love on yourself. You may be surprised by how corset waist-training can have certain emotional benefits! How do you cope with stress during waist training? Share you tips and tricks here and I’ll happily pass them on in order to be helpful to others. For certain, life has its stresses for every person alive, and there is today, information overload causing “continuous partial attention” says former Microsoft executive Linda Stone (see her bog, The Attention Project), as reported by writer Katy Read in “May I Have My Attention, Please?, AARP The Magazine, July/August 2010. Everyone responds differently sometimes even to identical stressors. I’ve already discussed above, the possible benefits of over-preparation before public presentations, especially for those who are corseted and tend to be introverts in their work and personal lives. According to one doctor, “Studies in humans show that stress in around 30% of the population decreases food intake and induces loss of weight.” (See, http://www.news-medical.net/health/Obesity-and-stress.aspx). Apparently, for the most of us stress works in the opposite direction. Everyday health online reported in 2009 that there was finally some research that linked stress and obesity(see, http://www.everydayhealth.com/diet-nutrition/food-and-mood/stress-and-dieting/stress-and-other-causes-of-obesity.aspx). (N.B. Actually webmd reports that as early as 2007; see start of this blog) I ran across the same idea on August 10, 2015 when listening to Good Morning America.. Stress raises our craving for glucose and changes our brain chemistry. It triggers the release of insulin, leptin, ghrelin (that causes hunger) and other hormones. Since “no one craves carrots” according to the GMA reporter, then you’ll be particularly challenged to “exercise your nurturing, rational adult” as I call it, and concentrate hard on your training program. However, the very good news is that a very routinized training program can work to counter stress! One day I read that certain research suggests that when stressed we not only eat more fats and sugars, but we comfort ourselves with familiar routines. That was when I realized why some of my students have done quite well with waist training, even when they have lost jobs or been served with divorce papers! The comfort of a daily corseting routine that is familiar and disciplined, can provide structure to an otherwise chaotic situation, and you may well find that corseting reduces your stress level, rather than exacerbates it. So don’t automatically conclude that corset waist training will make your busy, stressed-out life less manageable since it might happily work in just the opposite way. The very strange thing is that the new research results are “published in the journal our roon.” I’ve never heard of a journal called “Our Roon” so I assume this is an editorial type. Perhaps it will be corrected so that we find the actual report and read it. Anyone have any ideas here? It’s always instructive to receive the post-graduation evaluation of my coaching students. Dorothy just reported in after her 2.25″ waistline loss and 12.8 lb loss. In sum, she felt thoroughly prepared for her training program in advance of starting. She knew what to expect and what to change. Looking back she was pleased with her results at a level “7” our of a scale of 1 to 10. As for why she felt she did not meet her original goals, she believed them to be a bit too ambitious for her actual lifestyle (Dorothy is a busy vet). What was difficult was working in her corset during the long hours she had to log toward the end of her program, but she never gave up. What kept her in the corset was to remind herself that she only had “one more hour to bear up”–and she did! Her advice to others? Be ready for a serious commitment, be ready to learn some truths about yourself, and be willing to change. As for things she might go back to after her program, she said that she might eat a few more desserts from time to time, but plans to corset three days a week to keep focusing on her core and improved posture. We are strict in emphasizing to daily engage the transverse abdominus muscle (located horizontally just under and below the belly button) which has a direct correlation to pulling in and minimizing the gut. Dorothy now knows it works and you can see t he results above in the ‘before’ and ‘after’ side silhouette images. Note how her belly rounds out in the ‘before’ picture, but goes straight down in her ‘after’ picture. The small pooch at her waistline is actually caused by her pants upper edge showing under her cami top. Anticipating graduation and the end results. Improving her eating: food and manner of eating. 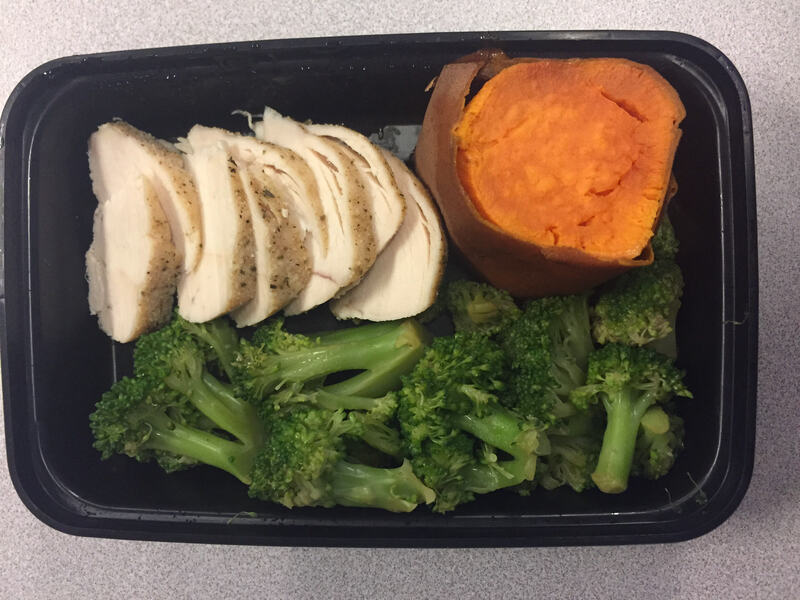 Cutting back on fried foods, fats, sugars, alcohol and coffee. Cutting back on cereal for breakfast and carby-snacks. Monday morning measurements and report to Coach and Training Buddy. One day off a week to look forward to. Drinking more water and juices. Telling/sharing with others her program progress along the way.